Giving mums a great start for 29p per copy - also ideal for feeding advisers, midwifes and health visitors. What is the Mothers & Others guide? 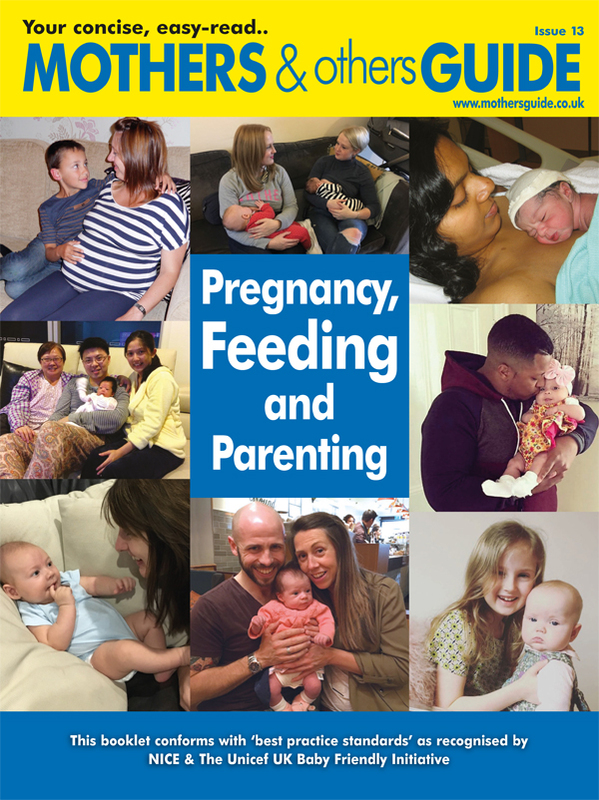 It is a concise easy read booklet to give them all the information they need to make informed choices about feeding and caring for their baby. It conforms with best practice standards as recognised by NICE and the UNICEF Baby Friendly Initiative. A reference booklet for staff on the new standards that are required for Baby Friendly Accreditation that is updated every year. It brings several leaflets together in one booklet so trusts need only purchase this. NEW section on Baby Friendly standards for formula feeding information. LATEST INFORMATION on reducing the risks of Sudden Infant Death. LATEST A,B,C,D guide for safe sleeping. LATEST guidelines on Vitamin D for everyone. "The mothers and others guide has been invaluable in providing essential understanding for a successful feeding journey in an engaging & colourful format. When the trust began to focus on stage 3 Unicef BFI it became clear that this type of learning for mothers would not only help us to achieve all the standards required but that the booklets would aid that meaningful conversation to ensure we meet individual needs"
"I totally agree with the research findings. We hand out at A/N Breastfeeding awareness evenings for parents-to-be and also to any attending grandmothers-to-be; P/N on the ward for every breastfeeding mother, to every Obstetrician and Paediatrician I train and all midwives and midwifery assistants were given a copy when trained. We get excellent feedback from Mothers on the wards. It's a gem, in a league of it's own!" "Here in The Rosie Hospital, Cambridge we provide all expectant mums with the guide, which we use to support good conversations around feeding during pregnancy and after birth. We find the pictures on positioning and latching particularly helpful to enhance women's understanding. We also use the guides as a useful tool in staff training sessions, confident that the information conforms with BFI and NICE best practice standards." "The Mothers and Others Guide is given to all pregnant women in Nottingham CIty, and is invaluable in informing them about the benefits and management of breastfeeding. It is helping us to achieve UNICEF Baby Friendly standards in giving information to antenatal women." "I would like to say that we use and love the Mothers and others Guide, it is an invaluable resource. We use it every day in our 10 o'clock feeding talk on the post natal ward to highlight the information we are trying to convey." "When speaking with new mums about breastfeeding, it can seem very daunting for them to take everything on board; having this user friendly magazine with excellent pictures and evidence based knowledge makes the process much easier."